"we do not know how to get home"
✅ Trip Verified | Tel Aviv to Amman via Copenhagen with Royal Jordanian Airlines. We did not get any information regarding the delayed flight, we had to look it up online ourselves. The information provided of the lady in the check-in was rude and not at all polite. She talked to us like we should know everything ourselves. The flight was 3 hours delayed and she didn't provide us with a connecting flight to Copenhagen. So at the moment, we do not know how to get home. It is the worst service I have ever received from an flight company. ✅ Trip Verified | Trip from Moscow to Aqaba via Amman and back. 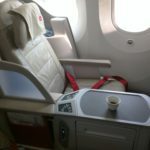 I enjoyed my flight with Royal Jordanian. Although ground service was a bit hectic, it was friendly and efficient. The planes were not particularly new, but the seats were very comfortable. 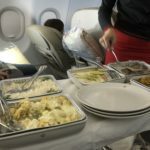 The food served onboard was delicious, cabin crew was very nice and performed their job professionally. All flights were on time. Our connection in Amman on the way back was very short, that is why one piece of our luggage was left in Amman, but it was quickly found and sent back to us with the next flight and delivered home. "incompetence and lack of care"
✅ Trip Verified | Amman to London. My one and only time I will travel with this awful airline. What a misfortune to travel by this airline who in this day and age still prefers to treat its customers with the utmost rudeness you can imagine. No courtesy, smile, welcome, plain indifference topped up with total incompetence and lack of care. Still living in the dark ages. Please take note and avoid. ✅ Trip Verified | Worst customer service I have ever experienced. My husband’s luggage was lost 6 weeks ago. I understand that this can happen, but the problem is the appalling lack of customer service following this event. We have sent over 18 emails and made more than 20 phone calls, but get limited to no reply and still have not even been able to get a link to or a compensation form to fill in for compensation. I have never been so frustrated or experienced such poor service. 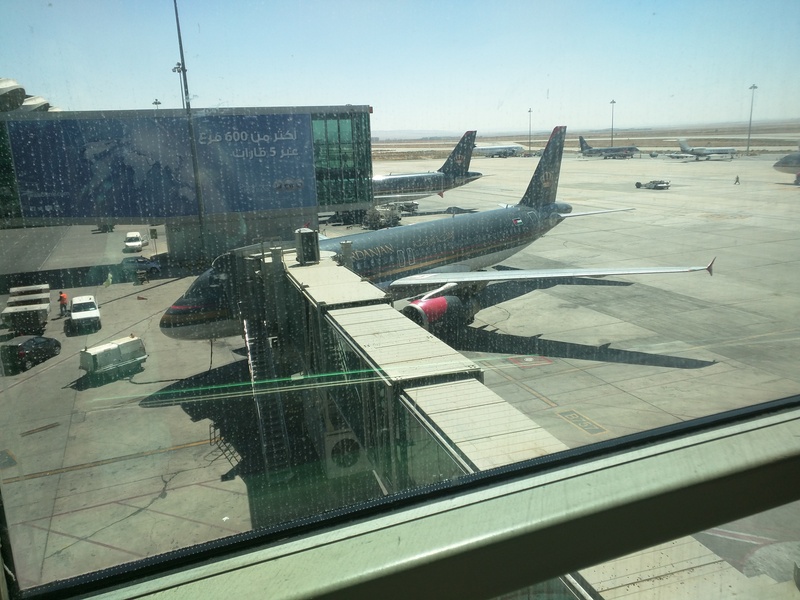 I will never again fly with Royal Jordanian Airlines. "Service rushed and not very attentive"
✅ Trip Verified | Well yes, they were 26 minutes late arriving at Zurich, but we also arrived just 26 minutes late at Amman airport, which is comparably small, easy and fast to navigate. We had just 8 minutes from plane to plane. Flights themselves uneventful, seated in row 8. Standard Recaro seats with personal screens and a better that nowadays pitch. Comfortable. Entertainment system not very responsive and remote control not very intuitiv at first, but you will manage. Food served in boxes with not really healthy options. This is less important, because you always have the option to buy lunch/dinner at the airports and bring it onboard. Service rushed and not very attentive. We got twice actually not really what we have ordered or only the half. Only on service on these 4.5 and 2.5 hours legs. But we brought drinks with us too. - As the tickets for two was the same price as one ticket with the cheapest competitor, quite a fair deal. ✅ Trip Verified | Amman to Sulaimaniyah. Insufficient cabin service, the food was rubbish it included 3 items which were unhealthy cakes and sugary juice. The Airline office told me that they checked in for me to a seat close to my dad who purchased business class, but when we went to the airport we found out that it wasn’t like that. The seats were an absolute discomfort. ✅ Trip Verified | London to Amman (and return) B787 Economy Good, competent performance by RJ. On time departure and arrival both legs. 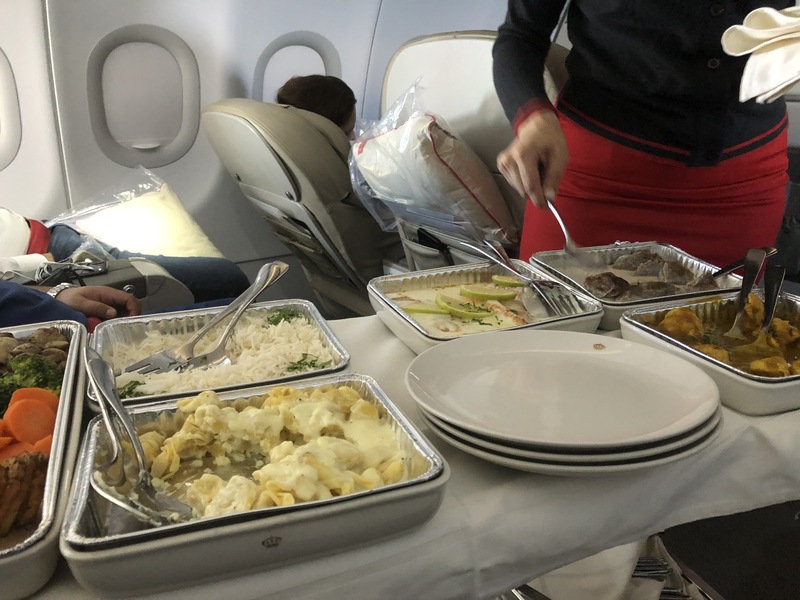 Catering as good as one might expect in economy. IFE limited but manageable. Sound quality a bit of a struggle. Boarding pass control at gate at AMM a bit clunky - long wait for economy while business / frequent flyer line sat empty and didn't respond until prompted. ✅ Trip Verified | Flew Royal Jordanian crown class for the first time from Bangkok to Chicago via Amman. Overall a fair experience. The plane was clean and seats reclined fully but service was very mediocre and the food choices were more like what you would get in coach. The wines were of poor quality and the service was unattentive. After the food was served the attendants spent most of their time behind the curtain and if you wanted anything you would need to hit your button. The configuration of cabin is 2-2-2 and thus if you are in the window you have to crawl over your seatmate to get access to the bathroom. The first row has much more foot room then the other rows and I found it more comfortable on my second leg of the trip as I was in the second row on the first leg. The lounge in Amman is also fairly sparse in terms of food, drink and cleanliness. In contrast I flew Qatar Airways outbound which was fabulous. 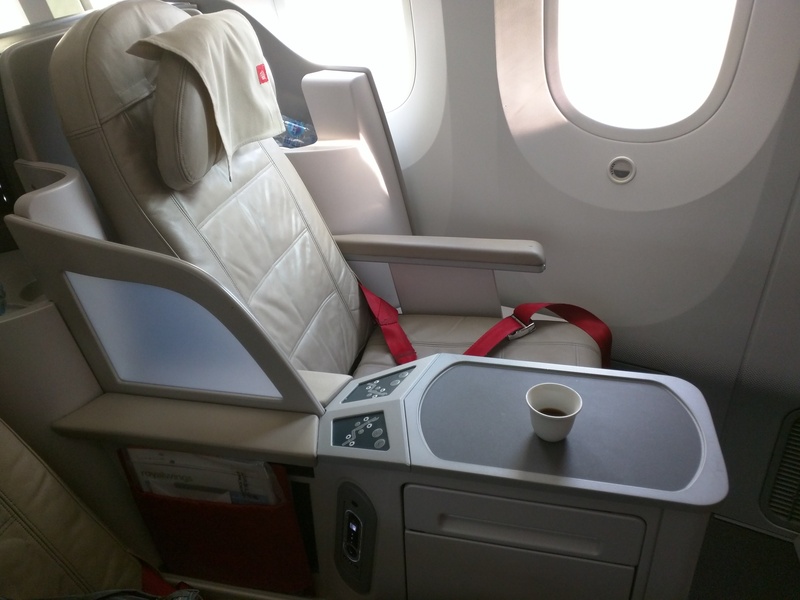 Overall this was the worst business class international flight I have been on. Additionally the IFE was of poor video quality and very limited western choices. I would certainly look to another airlines if possible as Royal Jordanian is well behind other carriers in the business class offering. "half the price of Emirates"
✅ Trip Verified | Bangkok to Kuala Lumpur. I have had the pleasure to fly RJ on a number of occasions. I have flown on each occasion except one in business class and have been impressed by the professionalism and charm of the cabin crew. On the Asian regional services they use Thai based female crew who are terrific. The male Jordanian flight attendants are surly. It is a middle eastern guy thing but they are fine. RJ get bad reviews for economy class and my only time flying in economy was some 7 years ago on a regional flight which was 80% empty and the guys serving in the back were terrific bringing me champagne from Business Class in little bottles and one of them threw one of the bottles across the mainly empty cabin to his colleague who caught it which was met by both attendants laughing! I am not quite sure this would happen on Emirates or BA but the guys and the champagne were great. I think the service has likely tightened up since then. It is a 3 star airline and half the price of Emirates. The seats in Business are tight and the cabin is dated with no single seating but it is good value for money with quality food and drinks. There was one flight where the safety announcement continued being played as the plane took off on a night flight and the lights were not dimmed until after the announcement concluded and the plane was in the sky. Ground service in Bangkok is outsourced and the staff are disinterested. In Kuala Lumpur they were abrupt, work for Malaysia Airlines and their manner is bad. "do not fly with Royal Jordanian"
✅ Trip Verified | Madrid to Beirut via Amman. Do not fly with Royal Jordanian. This company used to be good. But it is going downhill. Their delays are so frequent that it is always the same scene in Amman Queen Alia Airport: RJ employees rushing customers from connecting flights. I traveled with them back in December 2018 to Spain and returned in January 2019. The departure flight was the worst flight experience of my life. Everything bad that could have happened did happen (except for a plane crash, luckily). Our flight started in Beirut, then Amman and Madrid. Due to fog in Amman airport, the airplane was delayed and delayed and delayed. Now, a respected airline could have canceled and told the passengers go home. But RJ took off and then we were stuck in the air hovering over Amman for hours. Had they acted differently, they should have rerouted those passengers destined to far away destinations and ask those who can wait for the following day to go home and sleep. So after hovering in the air for hours, they were running out of fuel and unable to land in Amman they went to Aqaba airport. Passengers were stuck in the aircraft, it was hot and we were not offered any clear answer. The staff was in complete disarray. The passengers were nagging, children were crying and the crew could not offer any clear answer. Empty looks in their eyes revealed how clueless they were. After over 3 hours wait, the plane went to Amman. We needed a new boarding pass so we can resume our flights to our final destination and enter a new wave of utter chaos, yelling, pushing, screaming, and more for over 3 hours. For the hundreds of passengers, RJ decided to put only 2 ticketing employees to solve our woes! Needless to say what a complete chaos it was. As our flight to Madrid took off, we had to stay in so RJ offered us a night stay at their Airport hotel. Again the experience was horrible. We had to wait over an hour for the employees to take us to the hotel. By then we were just exhausted and ready to sleep. The flight to Madrid goes according to plan, luckily, although with some minor delay, after all, it's not RJ is there's no delay! We arrive in Madrid, but our luggage didn't! We talk to the crew telling them about the total lack of professionalism and so on. We report the missing luggage in the hope that they will be shipped to us. Two days later, nothing arrives even though the RJ office in Amman confirmed that the luggage was shipped the day after our arrival. We call RJ office in Amman, no one answers. So we went to the airport to see if we manage to recover our suitcases. To make the story short we had to run through two terminals (T4 and T2) to get back our suitcases. On the return flight, the flight from Amman to Beirut was delayed for 4 hours with no explanation. 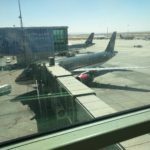 In summary, do not, I repeat, do not fly with Royal Jordanian, even if their tickets seem fairly priced, you will pay for it by delays, lack of professionalism by their ground crews and more.